Even after spending a week with the Kia K900 the car remained somewhat of an enigma. For most people the idea of a $60,000 Kia is as foreign as a $200 McDonald's burger. Before we touch on price let's talk about what the K900 is. In a word: wonderful. (That was fast.) The K900 is technically a rival to the Acura RLX, Cadillac CTS, Lexus GS, and, oddly enough, the Hyundai Genesis with which it shares a platform. All it took was a week for me to see the competition differently. 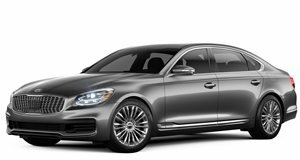 In terms of price, the K900 is a match for mid-size luxury sedans like the Lexus GS350, Audi A6, Mercedes E-Class, and BMW 5 Series. The base V6 K900 starts at $49,000. Our tester was the V6 Luxury model which carried a starting price of $54,900. This premium gets you added features like Nappa leather seats, a Lexicon surround sound stereo, and what Kia claims is real wood on the console. It also came equipped with the VIP package for an extra $5,000, adding a host of impressive features such as a HUD, autonomous braking, lane departure warning, ventilated rear seats, power reclining rear seats, a premium headliner, a surround view monitor and more. The final price: $60,850. If you went to spend $60,000 on a German luxury sedan you could end up with a BMW 535i, Audi A6 3.0T, or Mercedes E300. The BMW and the Audi both come with V6 engines, but the Mercedes only comes with a 2.0-liter four-cylinder at this price. The K900's V6 is a 3.8-liter unit with 311 horsepower and 293 lb-ft of torque. An eight-speed automatic is the only transmission choice. There is also a 5.0-liter V8 on offer with 420 horsepower, which power freaks may prefer, but the V6 never made me feel like I was lacking power. Shifts were incredibly smooth and acceleration was effortless in all passing situations. The V8 probably provides more aural stimulation when you mash the pedal, but the V6 did an admiral job making me feel like I was behind the wheel of a premium product. I averaged around 19 mpg, which falls right in line with the EPA's 17 city/ 26 highway rating. So what was the K900 like to drive? Many people have called the K900 a Korean Lexus LS, and there are a few similarities. Both cars have an extremely comfortable ride and do a great job of keeping you protected from the outside world. I drove the car through Florida's famous torrential downpours and would have never known had the windshield wipers not been on. The K900 never hydroplaned once, and the car felt completely planted despite the inundated roads. Even when the downpour completely took away my visibility I knew that I could call upon the K900's lane-keep assist and adaptive cruise control to keep me safe. The adaptive cruise control is excellent, although no car company can really match Tesla on this front. Still, the K900's system can take the car to a standstill, unlike the Lexus system which beeps at you if you go slower than around 30 mph. The K900 makes stop-and-go traffic a breeze. If you leave the system set it will stay locked on the car in front, although if you stop for more than around five seconds you will have to hit a button to make it resume. The K900 can almost drive itself, which is just a fraction of the comfort that the car provides. On the inside it seems like Kia cherry-picked all of the best components from the Germans. The steering wheel looks like it was lifted from the previous generation S-Class, as do the door-mounted seat controls. The shifter is nearly identical to the unit that you'd find in any modern BMW car and the paddle shifters feel exactly like the ones from an Audi S model (albeit much more plasticky). The interior has everything that you could possibly ask for from a $60,000 car. If you wanted to get ventilated front seats and the same safety features in an Audi A6, you'd have to spend at least $68,000. If you wanted to get a German car with the same features as the K900, you would have to step up to an A8, 7 Series, or S-Class. These are the cars that the K900 is more akin to. It floats over bumps but feels sportier than a Lexus LS. The steering feel is better than the Lexus and gets even better when you put it in sport mode. It may sound crazy, but when the K900 is in sport mode it has genuine steering feel. If you go over a bump in sport mode you can actually feel it through the steering wheel. It is almost, dare we say, sports car-like. The K900 really does drive like a German flagship, particularly the A8. After recently driving a 2011 A8 I noticed a lot of similarities. The German cars aren't exactly sports cars either, so if you just want something that is incredibly comfortable and somewhat fun to drive, the K900 is actually an excellent choice. The K900 isn't just good for the price, it is genuinely good. There is just one problem everyone had with it: the badge. 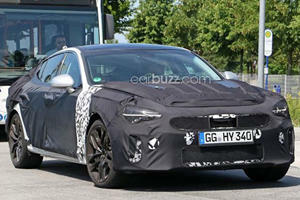 No matter how impressive the K900 was it seems like other people just can't get over the fact that this car is a Kia. I asked everyone I knew what they thought of a $60,000 Kia. You can probably guess how they answered that question. After I showed them cool features like the soft-close doors, reclining rear seats, and the premium headliner with panoramic roof their opinion seemed to change (a bit). There is no doubt that the Kia K900 is the most impressive, tech-filled car that you can buy for $60,000. No new car, German or otherwise, can compete with this level of luxury and this price. However, people just don't seem to like the idea of spending this much money only to get a Kia. Even my other friends in the industry said that they would take a BMW 535i instead. Their bro-ish reasoning went something like this: "If you walk into a club, girls are trained to notice guys with a BMW key. And that's all that matters." I can't speak for the entire female population, but I can see the logic here. No matter how nice the Kia is, people won't know until you show them. Even if you drive a base 320i, people are always impressed when you say you drive a BMW. So the Kia may not be great if you want to pick up girls at the club, but for those of us who aren't pickup artists (or who are married), this could be the perfect luxury car. However, I will tell you that you should try and buy the K900 slightly used. I did a search in my area and came across a certified-pre-owned 2015 K900. It was the more powerful V8 model and had only 22,000 miles on it. It came with a 10-year, 100,000 mile warranty just like a new K900, but this used model only cost $32,888. The car is for sale at Orlando Kia West, and I would highly recommend that someone go buy it. If you can find a bigger car with more luxury features and a certified-pre-owned warranty for less than $33,000 please email the listing to tips@carbuzz.com. We'll wait. Anyway, at under $35,000 the K900 is easily the best used luxury sedan that you can buy. Sure, you could get an S-Class that is several years old, but those German-car repair bills can add up when you don't have a warranty. We were blown away by the Kia K900, although we would probably recommend that you wait and buy one that is a year old, assuming you don't mind having a slightly used car. No matter how you buy a K900, new or used, it is clear that Kia isn't just playing around in the luxury car segment. It has built a car that should make the Germans scared. Now if only it could do something about that badge. Photo credit: Rfriesphoto and Kia Motors.